The series is set to culminate at the end of 2016 with a Global Shootout event at Mazda Raceway Laguna Seca to crown the champion. That individual will receive, along with the typical race winnings from Mazda's excellent contingency program, a one-day test in Mazda’s TUDOR United SportsCar Championship prototype racer. To complete the value equation, Mazda tells us that they are working to make sure the car is competitive in SCCA T3 class club racing. That means you not only have an MX-5 Cup racer but a car you can run in local events to keep sharpening your skills. 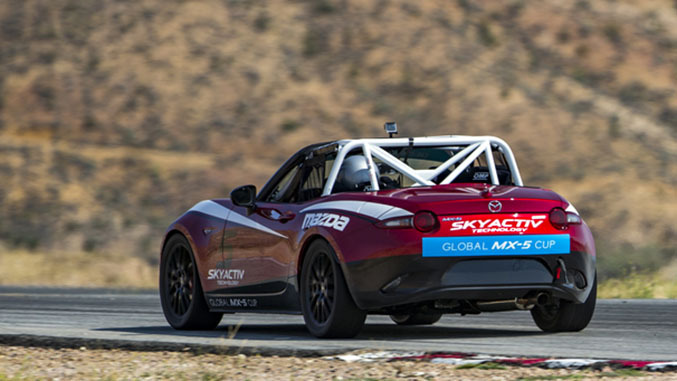 Compared with the last generation MX-5 Cup car, horsepower falls slightly to about 160 while torque is up at around 150 pound-feet. However, because of Mazda’s weight savings efforts with the ND Miata, the new Cup car is, shockingly, even lighter than the original NA spec car. Mazda pegs the figure at under 2100 pounds. Additionally, while peak power is down slightly from the NC car, Mazda explains that the new 2.0-liter motor makes much more power lower in the rev range, and along with its quick ratio gearbox, the new car feels much faster around the road course. Having driven both back-to-back, we’d absolutely agree. The new car also feels much more civilized than the earlier iterations of the car, and that’s largely good news. The power assists that found their way into the NC car are present here as well, though in the case of the steering, the assist is of course now electric rather than hydraulic. But as we mentioned in our review of the 2016 MX-5 road car, the company’s engineers developed rack-mounted system rather than using one implemented on the column specifically to address the potential pitfalls of electrically assisted systems – numb steering. Mazda says the electric rack is as communicative as a manual one, and while we’re not entirely sure that's the actual result, we will say that it provides enough feedback to let you know what the tires are doing underneath you. Of course, compared to the NA and NB generation spec cars the steering feels especially light (it is assisted, after all), but after a few laps we quickly acclimated to it, and the reduced effort may prolong the onset of driver fatigue for those that are used to having to manhandle the wheel. Ingress and egress from the ND cup car is substantially easier than on previous MX-5 racers, an item of particularly welcome news for taller drivers. Mazda states the ND Cup car is designed to accommodate drivers up to 6'4" in height, and the car is supplied without a race seat so that drivers can select a seat and mounting position that's best suited to them.